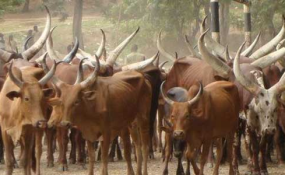 On Tuesday, a joint operation between Emanguzi police and Mozambican police was conducted in the Emanguzi policing precinct and it resulted in the arrest of four suspects and the recovery of stolen cattle. Suspects aged between 18 and 26 allegedly stole the herd of cattle from Mozambique, crossed the border into South Africa into Mtikini area, Emanguzi. Suspects were detained at the Emanguzi police station and will be sent back to Mozambique. They will be charged for contravention of the Immigration Act and stock theft. Stolen livestock was positively identified through brand marks and transported by members of the Stock theft Unit to Babanana for quarantine purposes.